So, as the dog days of summer wind down and the studios finish dumping their late summer dreck on us (I'm looking at you Fantastic Four, American Ultra, Man from U.N.C.L.E.) we focus our eyes on the fall heavy hitters season. 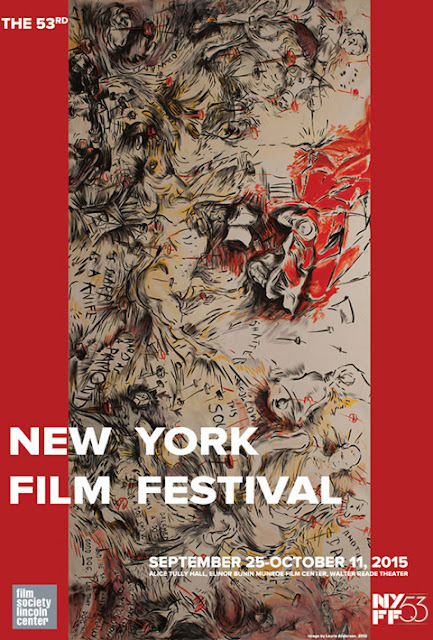 While most of the world awaits December for the force to be awakened once again, the fall brings us the 53rd Annual New York Film Festival which runs September 25 - October 11. (That's the poster, above, designed by Laurie Anderson.) The main slate of 26 films were just announced and this year looks to be uniformly wonderful. Let's pick a few highlights. The opening night film is Robert Zemeckis' The Walk which depicts the true story of Phillipe Petit's August 1974 historic cable walk across the World Trade Center's Twin Towers. (You may have seen the documentary about this, Man on Wire.) If you have seen the trailer and you know Zemeckis's work, you know this should be a dazzler. The middle "Centerpiece" film is the much anticipated Steve Jobs from director Danny Boyleand writer Aaron Sorkin. Blithely pushing aside that earlier Ashton Kutcher version, this should cast a wider, more intense net (word from a friend who saw a test screening earlier is that it's great and Michael Fassbender playing Jobs is fantastic). This year's closing night film, and one which should be on the radar of all the music fans here, is Don Cheadle's directorial debut Miles Ahead. It's a portrayal of the legendary Miles Davis starting from his time holed up in his Upper Manhattan apartment in the 70's and looking back on one extraordinary life. Besides the opening and closing night, there are two other world premiers: Steven Spielberg's cold war drama Bridge of Spies and Laura Israel's documentary about the amazing photographer/filmmaker Robert Frank. There are also new works from festival mainstays such as Hong Sansoo (Right Now, Wrong Then), Arnaud Desplechin (My Golden Days), and Michael Moore's intriguing new Where Do We Invade Next, Todd Haynes (Carol), Michael Gondry (Microbe & Gasoline), among others. Besides many of the above, I am really looking forward to director Jia Zhangke's new filmMountains May Depart. His 2013 festival film A Touch of Sin was one of my favorites that year. Also: the master Hou Hsiao-hsien's The Assassin; Thai director Apichatpong Weerasethakul's Cemetery of Splendor; insane director (not really but maybe?) Guy Maddin's The Forbidden; NY based director (who you might see out at local concerts all the time. I do.) Michael Almereyda's Experimenter and, well, there are just too many to name. It is a great lineup for all you film obsessives and a perfect start to what looks to be a powerhouse fall season. Be on the lookout as well for announcements on special events, documentaries, and Convergence and Projections lineup of films.